Where investment advice meets Main Street. In 2010 our model portfolio returned a solid twenty percentage points more than the S&P 500 Average. Our 35.2% return solidly outpaced the S&P 500’s 15.1% increase. In the seven years we have published the newsletter we have outperformed the market 6 times. Our cumulative return over this same time frame is 215% versus the S&P 500’s 33%. 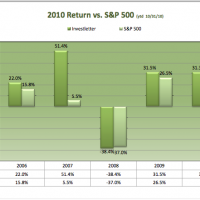 While we have only published the newsletter the past seven years, the same strategy has beaten the S&P 500 average ten out of the past eleven years (year ending 12/31/2010) and returned a cumulative 336% matched against a 5% return on an investment in the S&P 500. It is a lot easier on the eyes viewed from the charts below.